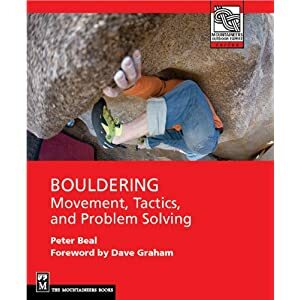 A recent post by another avid boulderer here on the Front Range prompted a follow-up on a topic I have been meaning to write about for a while. As everyone knows summer is by far the worst season for bouldering, unless you are above 10,000 feet. For consistency in temps, the winter is one of the best seasons here in Boulder, but you have to come prepared. So what do you need to know to get the most out of winter sessions? First, it helps to acclimate to sub-50 degree temperatures to begin with. Going straight out on a gray overcast 35 degree day kills motivation quickly. Make a habit of getting outside as often as possible on marginal days in spring and fall so you get comfortable with the routine of winter bouldering. Use common sense when assessing conditions. For most avid boulderers, below freezing means an unproductive day ahead unless there is full-on sun. Best conditions rest between 35 and 55 degrees F in the shade. If there is a lot of wind, forget it. Windchill will sap your strength very quickly and numb your fingers immediately. A fresh fall of snow can be problematic, meaning carrying a shovel and broom, if you are serious about bouldering. The biggest problem can be seeping when snow begins to melt. Be wary of holds after a heavy freeze-thaw cycle as they are prone to snapping if any water gets behind them. The type of problem should be considered as well. A short powerful problem on poor friction-dependent holds is a good choice as opposed to a longer one that may chill your fingers on link. Cooler air tends to be drier air meaning a stickier feel to the holds. Winter bouldering begins with appropriate attire. Some recommend long underwear for really cold conditions which makes sense but I have rarely found this helpful as this often feels heavy. Heavier fabric trousers such as jeans are OK as long as they don't get wet and start to chill you. Wicking fabrics are generally a good idea, especially for upper body wear. I recommend a t-shirt, topped by a lightweight front-zip warm-up jacket that is wearable while bouldering. On top of this, a thick hooded sweatshirt and/or down jacket is good for staying warm between tries. Try to avoid anything you have to pull over your head to remove. For serious burns on boulder problems, you will probably get down to a t-shirt and pulling things off over you head can chill you quickly as it exposes your torso to the cold. A thick warm hat is essential as are mittens or gloves. Footwear should reflect the approach conditions and allow your feet to stay warm and dry. It is helpful to get very warm on the approach. Overdressing is a good idea and if the approach is short, doing at least 10 minutes of aerobic exercise, fully dressed, before starting to climb. Bouldering easy problems is rarely much use. Beginning by doing some hangs and then trying moves on the project (which is the most likely reason you would climb in winter anyway) is probably best. Allowing your fingers to get numb while pulling hard and then letting them thaw back is the typical scenario. Try to keep your hands warm between tries and stash your climbing shoes in an enclosed space such as a jacket pocket or a separate bag, maybe even with a handwarmer. Warm shoes are much easier to put on and retain sensitivity even in cold temps. Be aware that cold air can produce hard "glassy" finger tips. Bring some sandpaper or an emery board to get down to softer skin with better friction. A generous amount of sweetened hot tea (lots of honey or brown sugar works for me) can be a real plus. I have also tried hot apple juice with success. If you bring food make sure it doesn't harden when it gets cold. Powerbars are notorious for this and can be inedible below 40 degrees. Trail mix with nuts, chocolate and dried fruit is a good calorie source in winter I have found. One thing you should never do in winter is build a fire to stay warm. If you can't hack it without an open flame, best to stay indoors. This also applies to torching holds to dry them, a practice which can weaken holds and cause them to break. Both tactics are ultimately destructive to the environment. The primary obstacles to having fun bouldering in winter are psychological. It may be as helpful to find a similarly obsessive partner as anything else you might do to prepare for winter. Good luck and stay warm! In a previous post, I described why bouldering inside is very different from outside, making it clear that I preferred being outside on real rock. Of course if I actually compared, hour for hour, where I spend more time, it would be in the gym. So what are the good things about the gym? Besides the obvious selling points of convenience and concentration of problems, there are intrinsic qualities I enjoy. One of them is social. I can climb by myself if I want or I can meet new people or hang out with those I already know. Many times outside I find myself alone or having to plan well in advance to meet up with a partner. In fact I can't count the number of times a chance gym meeting has resulted in a new opportunity for writing or some other project. For me the chance to climb on other people's problems,especially in a style I don't prefer, is a huge part of improving as a climber. Only at a good gym with good setting, can you encounter multiple ideas of what it means to move and which can encourage you to adapt accordingly. This can be a huge benefit in trying new problems or visiting new areas outside. In a gym, when motivation on outdoor projects is waning, an indoor project, with a tight deadline, can spark effort and drive. The knowledge that a problem will be coming down soon forces me to concentrate on getting it done as quickly as possible. This is a good attitude to take outside. The climbing style may not be easily transferable to outdoors but more athletic, dynamic kinds of movement promote an aggressive powerful approach that can yield real benefits on the rock. The tendency for rock holds to be small and often closer together doesn't mean that you don't need to apply overall body tension and compression to make the holds work. For whatever reason, I find that gym climbing especially, forces that side of my climbing to work harder. So although I would definitely prefer to climb outside as much as possible, I try to make as much as I can out of the gym experience, especially given the excellent range of options locally. Especially at the Spot, whose setting crew is second to none, but also at the Boulder Rock Club and CATS, is where I can maximize my limited training time and enjoy the experience at the same time. In this video, the Scottish climber Malcolm Smith emphasizes the need in bouldering to train your capapcity to climb straight on and in an open position. Much of the older technique advice out there describes the need for backstepping and dropknees to do moves on steep terrain. However, as Smith rightly points out, the footholds that are required for such moves often are not available on harder problems or are in the wrong position. A very helpful video for expanding your reach and usable power.